It has been a full week since Blu Cigs sponsored Mike Bliss driving #32 in the Coca Cola 600 last weekend, but I finally got video footage of it uploaded to YouTube yesterday. There are some great clips of the Blu Cigs car in it! 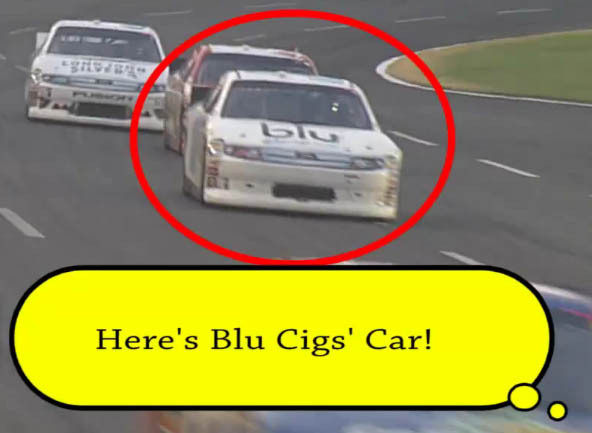 There are a lot of other YouTube videos of the event mostly because of the circumstances of the finish (which I will cover in a second), but so far NONE of them highlight the Blu Cigs car as much as mine. So be kind to me in the comments if I happen to say something that make me look really stupid. I have heard that NASCAR was on of the fastest growing sports in the U.S. and after making this video I think I am starting to see why. I think I am becoming a fan.. I scoured the footage to find good shots of Blu Cigs car. It was not easy because Mike Bliss hovered around 35 the entire race so the footage seemed to cut away frequently before #32 would come into view. Also, the announcers were more interested in talking and showing footage of about the top 10 contenders. the Blu Cigs car stalled out on the side of the track and caused the 6th caution of the race! Despite this Mike Bliss still finished in 30th place. Before the race even took place, commentators on the web were hopeful that he would finish or stay in the top 35 I can’t remember which. And, I sure as heck don’t know why they were hopeful of this except I think somewhere towards the end of the race the leader board at the top of the video started showing that any car after 35 place was “out.” Maybe this is why? I don’t know, but there were some very good shots of Blu Cigs’ car in the final laps actually racing (and making lazy caution laps with everyone else too). As a result of Earnhardt Jr. running out of gas on the final turn of the last lap, Kevin Harvick won the race. Everyone was low on gas towards the end as the Coca Cola 600 is the longest NASCAR race on the circuit. It seemed even more taxing on fuel supplies because it seemed all the caution laps were wasting fuel and cars would run out of fuel and almost wreck on the restart causing even more caution laps. Anyway, it was a very exciting race. I am much more inclined to watch another NASCAR race after this experience. I feel bad that Earnhardt didn’t win another race. I think I read somewhere that he hasn’t won in 105 or 106 races straight. That is quite a dry spell for Earnhardt fans. I was happy for Kevin Harvick though because he came from a few cars back right at the end to win it. I think it is this kind of excitement that keeps the sport growing. I also read somewhere that a “smoking product” hasn’t sponsored a car since the Winston brand in 2003. Could this mean that electronic cigarettes are entering the mainstream as a socially acceptable smoking alternative? Only time will tell. It will also be interesting to see if the Blu Cigs and Green Smoke NASCAR sponsorships in the Coca Cola 600 bumped up sales enough to initiate future sponsorships.